In 2015, Safaricom announced it was investing in Sendy, Nairobi-based package delivery start-up as the first recipient of the Safaricom Spark Fund. 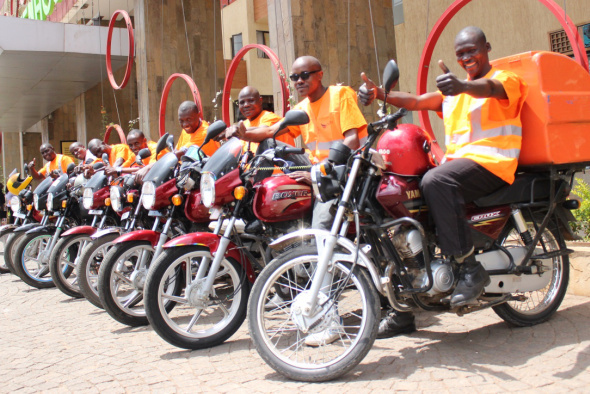 Sendy uses a mobile application to connect motorcycle riders, drivers of vans and pickup trucks to customers wishing to send packages and documents. Customers are able to track the movement and location of their packages in real time using their app and web platform. Ideally, a user will log onto the Sendy App or web platform and ask to have a pick up or delivery done for them. After the service is completed, they receive notifications complete with the name of the rider and point of delivery. Like Uber, Sendy is an intermediary and earns a fraction of the fees charged for pickups and deliveries. Sendy does not own any motorcycles and instead has partners who use its app for these services. The startup has operations in Thika, Nairobi and recently launched operations in Kisumu with charges for the delivery of goods within a city including a base fee of Kshs 140 for up to to 7 kilometers, Kshs 30 for additional kilometers and Kshs 50 for additional kilometers. This weekend, the company turns 1 year old and plans to offer free deliveries for all customers. A user will login into the App, key in their pick up and drop off location points for their item and the proceed to request delivery for the same. Sendy will complete this for free.